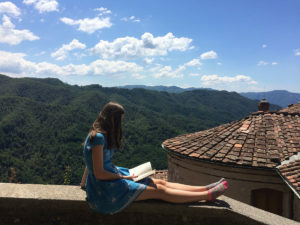 Elizabeth Walker set up Flutes in Tuscany in Tereglio, to explore all aspects of flute playing with inspiring tutors in breathtaking surroundings. The charming hilltop village normally exudes calm and tranquility, but for a week each summer the villagers are happy to forgo peace and quiet while the houses and streets echo to the sound of flute warm ups, rehearsals, lessons, ensembles and concerts. There are opportunities to play in a variety of concerts, both as a soloist and in ensembles, and our professional accompanist, Sally Halsey, and baroque continuo team of Julian and Sebastian, are available throughout the course. 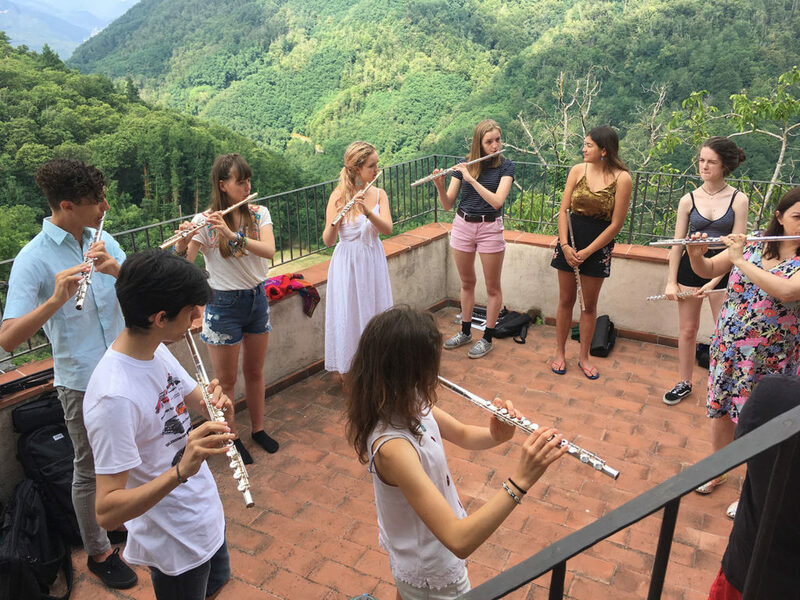 If you are a keen and mature young flautist aged 16 and above you have the opportunity to develop all aspects of your flute playing from this immersive week in Italy. If you are at music college and looking for performance opportunities and masterclasses, a chance to widen your Flute playing network and meet new flautists, work on flute ensemble repertoire and be inspired you will definitely benefit from this course. If you are an adult who loves hearing great flautists, would like to be involved playing alongside other adults, improve your confidence in performing and try new ideas, then this course is also for you. All our teachers and accompanists are experienced, inspiring and fully trained and DBS checked. North of Lucca and Pisa, perched high on top of a Tuscan hill, you find the remote and ancient village of Tereglio. In every direction, there are stunning views of forested hillsides and deep gorges. Accommodation is mostly offered in one characterful, balconied villa, containing six double bedrooms situated around a large three-storey open space, which is used for flute ensembles and master classes. Other smaller houses within the village are also used as teaching/performing spaces, as well as the local church and chapel. Part of Tereglio’s charm is that it follows the natural contours of the hillside and it consequently has numerous steep streets and paths, some of which are cobbled and uneven. This sadly makes it unsuitable for anyone with significant mobility issues, and suitcases that cannot be easily carried are best avoided. Train to Bagni di Lucca from Pisa airport via Pisa Centrale and Lucca and also from Florence and Bologna, via Lucca — trenitalia.com. A canyon carved by the Rio Pelago over thousands of years. A deep limestone gorge in the Val Fegana, under the slopes of the Tre Potenze and Rondinaio mountains. The Orrido di Botri has been a nature reserve since 1971 and the canyon is unspoiled. It is home to many rare and majestic animals, such as the royal eagle and the wolf. Besides the wolf that lives all year round in the Apennines, there are roe deer, hare, squirrels, marmots, foxes, porcupines, skunks, pine martens and a small group of goats.